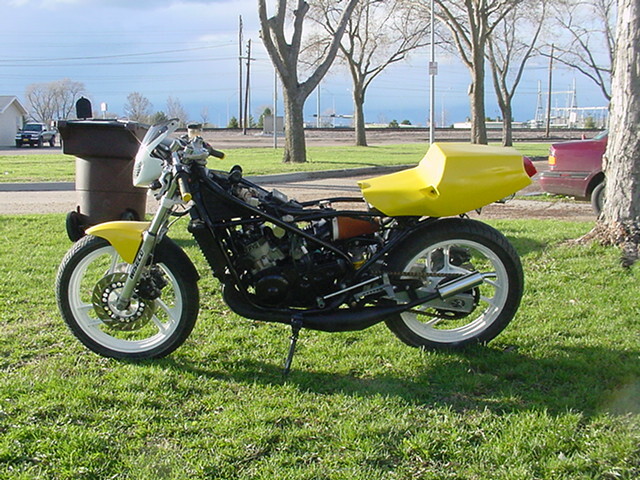 Click Here for Microfiche & 2 stroke Video collection. Current Project Yamaha Warrior 350 ATV 2.4 Gallon Fuel Tank And tank cover/body plastic- Seating position moved forward and down placing the bulk of the weight lower and in the middle of the wheels. Better handling, HANG OFF! Everything is going great but the horns on the end of the fuel tank need to be bent in to shape the frame by an inch and a half each. 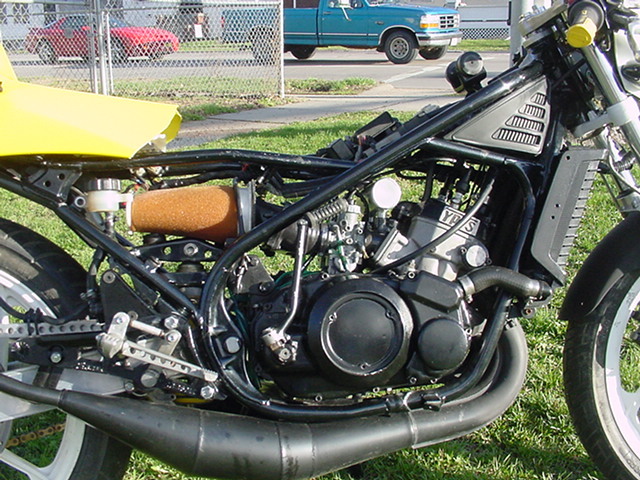 I may call off the whole project to fit a small plastic tank under a FZR600 Plastic Tank Shell. This may not work out because it's hard to judge size of items in pics before buying. Update: April 15 : Score! After Ispection I see I can mold the fuel tank to curve with the frame. That problem is solved. Tank cover plastc shroud will bolt on to the tank. The only problem I see in the future is cutting and molding the front plastic panel that will reside in front of the triple clamps. 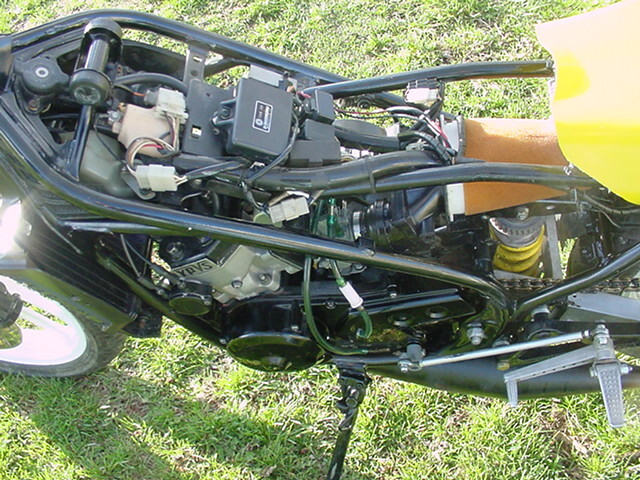 The end result of this project should look like a normal gas tank that slopes early before the steering stem to the flat surface. I already have a good fit between the tailsection and tank. Turns out this will only look slighty exotic. The goal is to make it look like it somehow belongs and the tank slopes early to give access to a panel to get to the rad cap. No more taking tank off to put coolant in or check level, coils,wires etc etc. Painting them will be the easy part. Update: Still wondering what this tank hack is all about for my bike I try to picture it. Something exotic but looks as it belongs is some mad way. Then I seen a picture(below) of the style I seen for this idea so blurry in my mind. Something that looks exotic,yet ATV yet somewhat normal yet future-istic? Can it be done? As good as the tank fits I say yes. Would it look lame or would it develope a charactor of its own? 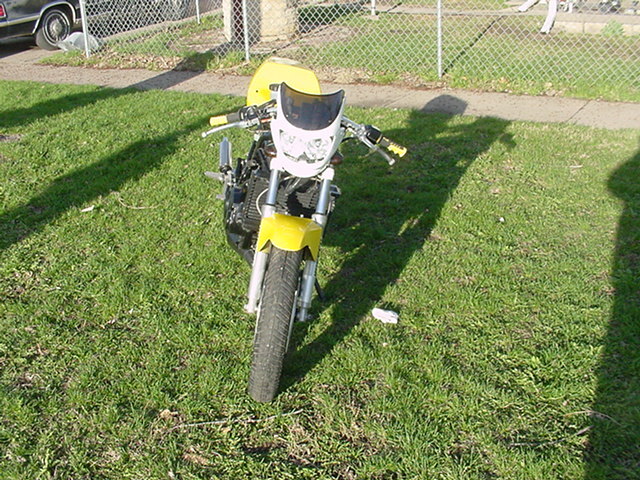 A street fighter with clipons with this almost ATV/Motocross looking gas tank area with this street fighter fairing, but with GP style rear sets and TZ style rear section. 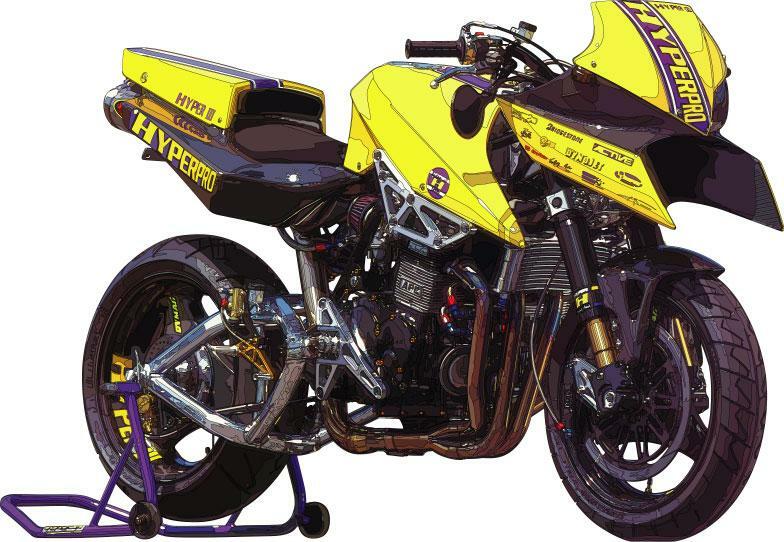 Simular to pic below but without that big chicken head on the front of the bike. Seat needs to come down and forward. (above) The powerplant. 364 cc of muscle. Understand the feel of the bike. it's a power to weight ratio monster!!! 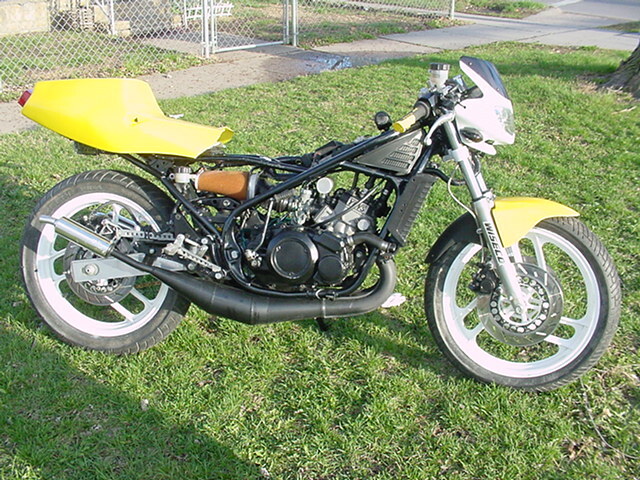 It easily launches the front wheel in second gear with a smooth twist of the throttle. Enough power to roast the rear wheel in third gear/45 mph in the rain. 100mph in fourth before all hell starts to break loose. Scary fast and light. Enough torque to make for a nice street riding experience. Rear Wheel Traction becomes a problem in the first 3 gears under power on rough dry street pavement. 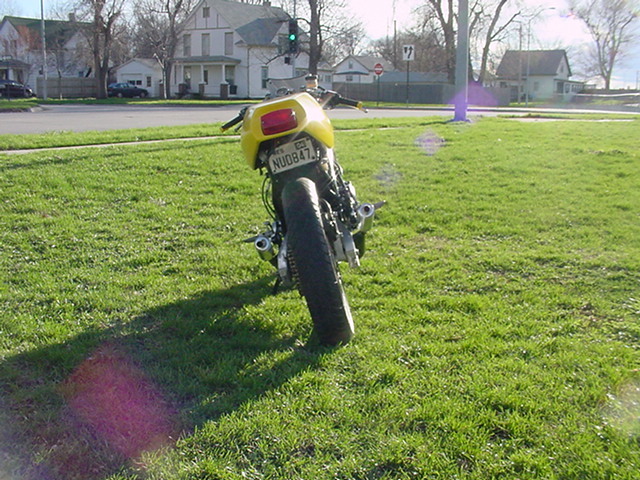 Two fingers on the front brake and the rear end gets really light. Will stop many feet before a dime. 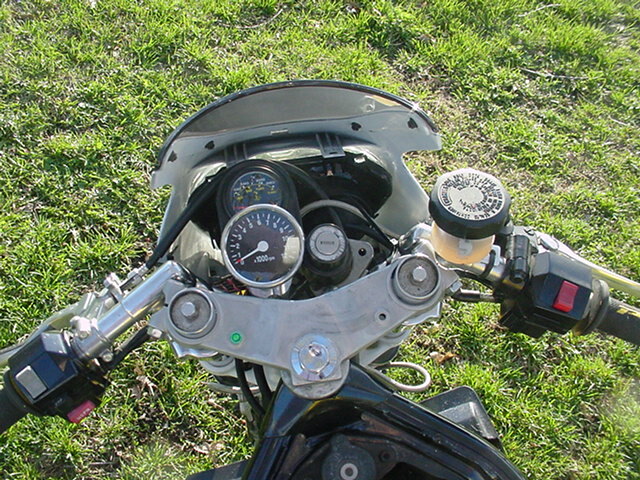 With a tricky hand on the clutch you can ride this bike below 1 mph just above a standstill. Perfect for stopping at stoplights with no need to put a foot down. More mimble than alot of bicycles at low speeds. Zero to sixty qucker than you can complete most small sentences. You can reach your fear limit in curves at speed and the bike just wants more. You couldn't ask for a more thrilling experience everytime you ride. You could be having the worst day of your life, the moment you get on this bike you forget what was ever bothering you. Smiles everytime. An adrenaline junkies dream but casual enough to putt putt around on.